Rich rosewood base with piano finish includes (12) laserable black brass perpetual plates and a header plate. 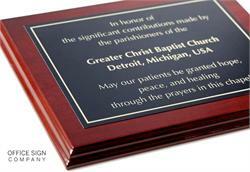 Text engraves gold on black coated brass to provide a classic look for this perpetual plaque. Include any text, logo or custom design you send us at no additional charge! Purchase this plaque to showcase your employees of the year, donations, years of service and much more. Keyhole mounting by screw or nail is made possible with pre-drilled openings on the back of each plaque. Mounting hardware is not included. Note: Plaque will be sent with all (12) plates. Blank plates will act as place holders. When adding to your plaque in the future, order the replacement plate only option ($4.95), and we'll send you a brand new customized plate. Please do not send blank plates back to be customized as the surface may have been compromised due to every day wear and tear. 8"x10" Solid wood plaque in striking rosewood gloss finish. 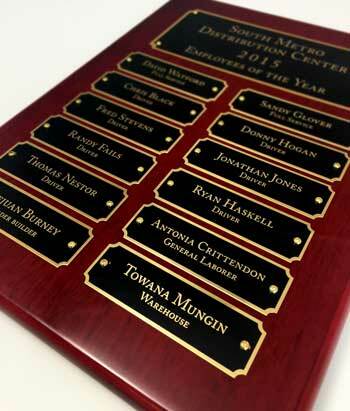 Personalized brass plate with custom text and logos for the perfect plaque or office award. Employee and corporate recognition made easy with free text and logos. QTY Discounts. 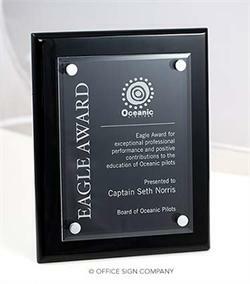 Floating Plaque Recognition Beautifully finished wood with floating Premier Acrylic. Your laser engraved logo and custom recognition text included. 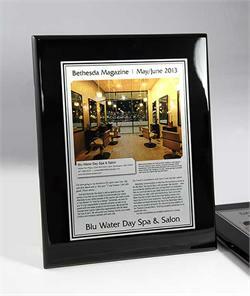 A stylish presentation for your award or corporate gift. Wall desk hardware mount included. 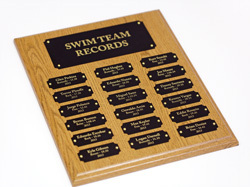 Perpetual plaque recognition - 10-1/2"W x 13"H Solid wood plaque in oak finish. Personalized black brass header plate with 12 individual black brass plates. Display years of service, donations, team records and more! 8"x10" Mahogany plaque with personalized black or gold plate including custom text and logos. 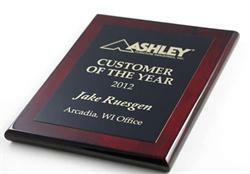 Choose from Black plate with gold graphics or Gold plate with black graphics for the perfect plaque or employee recognition. QTY Discounts.